​Electric transportation is a win for the nation, helping to meet customer needs, providing environmental benefits, and supporting America’s energy security. EEI’s member companies are leaders in promoting transportation electrification and are deploying the charging infrastructure needed to support the growth of electric vehicle (EV) sales. In October, the nation achieved an important milestone when the millionth EV was sold, and 2018 EV sales are up 48 percent compared to 2017. According to a new report by EEI and the Institute for Electric Innovation (IEI), Electric Vehicle Sales Forecast and the Charging Infrastructure Required Through 2030, EVs will become an ever more important part of America’s transportation landscape. The report forecasts that more than 18 million EVs will be on U.S. roads by 2030, requiring about 9.6 million charge ports to support them. The number of EVs on U.S. roads is projected to reach 18.7 million in 2030 (up from 1 million at the end of 2018), about 7 percent of the 259 million vehicles (cars and light trucks) expected to be on U.S. roads that year. Annual sales of EVs will exceed 3.5 million vehicles in 2030, reaching more than 20 percent of annual vehicle sales in that year. Compared to the prior EEI-IEI forecast (released in 2017), EV sales are estimated to be 1.4 million in 2025 (versus 1.2 million). About 9.6 million charge ports will be required to support 18.7 million EVs in 2030. This represents a significant investment in EV charging infrastructure. 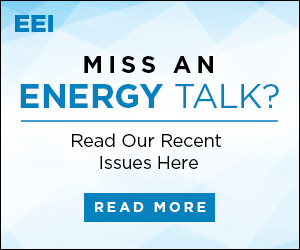 Read the EEI-IEI report​, learn more in Energy Talk In Depth​, and find key facts in EEI's infographic​. Below, find electric company C-suite leaders weighing in on how their companies are speeding EV adoption. Read an op-ed by EEI Vice President of Customer Solutions and IEI Executive Director Lisa Wood and Roland Hwang, managing director of the Natural Resources Defense Council’s Climate & Clean Energy Program, in Inside Sources. To celebrate 1 million electric vehicles (EVs) on U.S. roads, EEI hosted a forum at The Newseum in Washington, DC, that brought together automakers, electric company leaders, infrastructure providers, environmental organizations, customers, policymakers, and other thought leaders across the EV ecosystem. At the event, EEI and the Institute for Electric Innovation (IEI) unveiled the new study, Electric Vehicle Sales Forecast and the Charging Infrastructure Required Through 2030​. A panel of electric company C-suite leaders discussed how the electric power industry is working to advance electric transportation, creating innovative solutions to help customers drive electric, and making EVs part of their region’s transportation and environmental plans. “We see EVs as a customer option that gives value to the clean energy solution in our state,” said Alan Oshima, president and CEO of Hawaiian Electric Company, who explained some of the challenges and opportunities of electrification in Hawaii’s context. Anne Pramaggiore, senior executive vice president and CEO of Exelon Utilities, agreed. “At Exelon, we’re very focused on climate change,” she said. “If you can get the transportation sector decarbonized—and it’s all through the energy grid—you’ll make significant climate progress.” She outlined how Exelon is working to speed customer acceptance of EVs with innovative solutions like a customer app for EV information, ranging from charging station maps to available rebates. Expanding customers’ understanding and acceptance of EVs will be critical to developing the future of electric transportation, according to Terence Sobolewski, senior vice president and chief customer officer of National Grid. “This all boils down to choices that individuals are making—personal vehicles as well as other modes of transportation that are part of the shared network that will help us with mobility across many sectors,” he said. Southern California Edison (SCE) also is working to help customers and communities electrify mobility. The company has announced a rebate available to buyers of both new and used EVs, in addition to building a network of public charging stations that will number more than 1,280 by next year. “Public transit is a big driver of medium- and heavy-duty electrification,” said Jill Anderson, SCE vice president of customer programs and services. Electric companies are leading the way for electrification of medium- and heavy-duty transportation for public transit and freight hauling, as well as for industrial facilities like ports and warehouses. Other panels included a conversation among executives of automakers about the dynamics of the EV market; a discussion of the roles being played by policymakers, regulators, and other stakeholders in the EV ecosystem; and paths toward greater electrification of vehicle fleets and commercial operators. Photo (L to R): Jill Anderson, vice president of customer programs and services, SCE; Alan Oshima, president and CEO, Hawaiian Electric Company; Terence Sobolewski, senior vice president and chief customer officer, National Grid; Anne Pramaggiore, senior executive vice president and CEO, Exelon Utilities; Lisa Wood, EEI vice president of customer solutions and executive director, IEI. 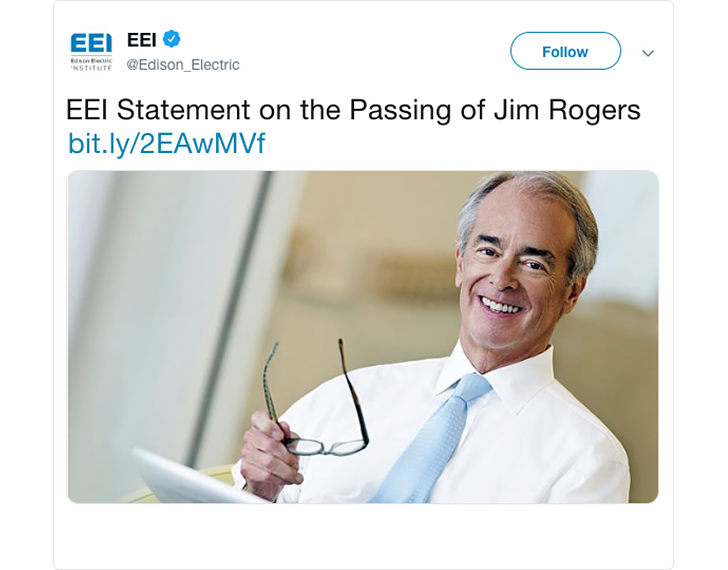 ​EEI’s member companies—America’s investor-owned electric companies—are committed to providing reliable, affordable, and increasingly clean energy for all customers. With the right public policies in place, electric companies can continue to make the necessary investments in critical energy infrastructure to deliver the energy Americans need. EEI President Tom Kuhn commented on the U.S. Environmental Protection Agency’s (EPA’s) and the U.S. Army Corps of Engineers’ (USACE’s) proposed replacement for the 2015 Waters of the United States (WOTUS) regulation: “EEI thanks EPA and USACE for moving forward with a replacement to the 2015 WOTUS rule. “By proposing a replacement to the problematic 2015 WOTUS rule, EPA and USACE have taken an important step in providing EEI’s member companies with greater regulatory certainty and clarity, while avoiding substantial new operating requirements and increased customer costs. EEI has been consistent in its support for a rulemaking that more clearly and narrowly defines which waterbodies are subject to federal jurisdiction and enhances opportunities to streamline energy infrastructure permitting. ​On December 6, the United States Senate confirmed Bernard L. McNamee to serve as a Commissioner of the Federal Energy Regulatory Commission (FERC). Previously, Commissioner McNamee was the executive director of the Office of Policy at the United States Department of Energy. 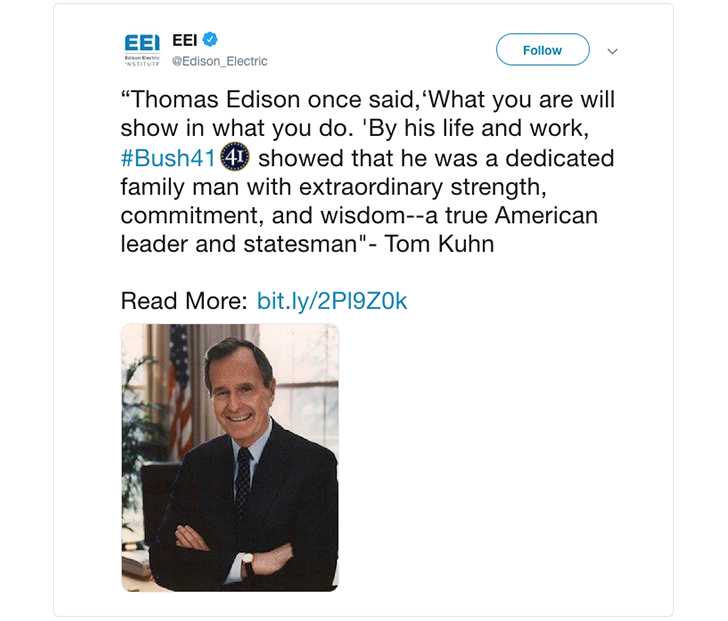 EEI President Tom Kuhn commented, “EEI and America’s electric companies thank Senate Majority Leader Mitch McConnell and the Senate for recognizing the importance of maintaining a full Commission and for voting to confirm Commissioner Bernard McNamee. We congratulate Commissioner McNamee, who brings an extensive amount of experience on federal and state energy policy and a strong commitment to public service. 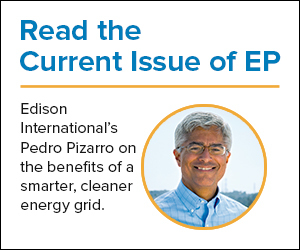 ​“Reducing emissions will require a new energy paradigm in which we reduce dependence on fossil fuel sources and use technologies to incorporate clean sources of energy such as solar, wind, and hydro across the economy,” writes Pedro Pizarro, chairman and CEO, Edison International, in Electric Perspectives. ​Electric companies are committed to delivering the innovative energy solutions their customers want. Exemplifying this is Alabama Power, which has created the Smart Neighborhood® Builder Program to partner with homebuilders across its service territory to construct energy-efficient homes that are more comfortable, convenient, and connected. Construction already is complete on Alabama Power’s flagship Smart Neighborhood, the Reynolds Landing community in suburban Birmingham, which has been called one of the most innovative energy projects in the country by the U.S. Chamber of Commerce. In 2019, Alabama Power will team up with three construction companies that will build 127 smart homes in three communities. Each Smart Neighborhood home is built to make residents’ lives easier, and combines enhanced energy-efficiency measures with smart technologies such as voice-activated security and smart locks, lights, cameras, and garage door controls. The smart homes also will feature improved insulation, high efficiency heat pumps and water heaters, and Energy Star® appliances. Alabama Power technical experts will support homebuilders on program standards and energy efficiency technologies. Learn more​ about how electric companies are partnering with many stakeholders on building the data-optimized smart communities of the future. An earlier version​ of this story first appeared on Alabama NewsCenter. ​PECO President and CEO Mike Innocenzo writes in Electric Perspectives: “In its first month of operation, the PECO Marketplace had more than 36,000 visits, $230,000 in sales, and 1,000 transactions. This shows us that customers are engaged, and we expect that to continue as we expand the marketplace and its offerings. ​Microgrids give customers more control over their own energy needs, while helping electric companies enhance the resilience of the entire energy grid and providing numerous benefits for all customers. Total installed capacity of planned and operational microgrids in the United States has nearly tripled since 2014, reaching nearly 7,000 megawatts, according to an EEI report released in November. Electric companies are active partners in that deployment, involved in 42 percent of U.S. microgrid projects. The share of non-military microgrids is growing dramatically, and, in 2018, they represented 84 percent of all microgrids. The decreasing cost of microgrid control technologies, a focus on resilience, and the increasing popularity of privately generated clean energy are the primary drivers of microgrid deployment. “Microgrids: Trends and Key Issues” includes examples of electric companies’ microgrid projects and an overview of microgrid policy activity during the first half of 2018. Read the report and learn more about how electric companies are using energy storage and microgrids together to provide benefits to all customers on EEI’s issue web page​. ​Michels builds, maintains, and repairs the reliable electrical infrastructure essential to everyday life. Our experienced crews are trained and equipped to work safely on transmission and distribution lines, substations, and structures in all states and types of terrain. Michels also self-performs related services, including site preparation and foundations. ​Nominations are open for the 2019 Edison Award, which honors distinguished leadership, innovation, and contributions to the advancement of the electric power industry. The Edison Award is presented annually to one U.S. and one international electric company. It is EEI’s most prestigious honor. Any EEI domestic or international member company may nominate itself or any other member. A panel of former electric company chief executives will select the winning U.S. and international companies. San Diego Gas & Electric (SDG&E) received the 2018 Edison Award for its investments to enhance grid resiliency and to reduce climate-related and weather-related vulnerabilities, like wildfires, to ensure the reliable operation of the region's energy grid for generations to come. SDG&E has developed, and continues to improve upon, a comprehensive fire risk mitigation program designed to prevent the ignition of wildfires, improve grid resiliency, and enhance public safety. This includes significant strategic investments to fire-harden the energy grid, increase situational awareness, update operating protocols, and improve its region’s ability to respond to wildfires. State Grid Corporation of China (SGCC) received the 2018 International Edison Award for its robust, integrated, and flexible charging network that is essential for electric vehicle (EV) growth and deployment in China. SGCC developed the Smart Internet of Vehicles EV Charging Network, which allows the company to expand its EV capacity. In the process, SGCC overcame significant barriers to success, including a lack of standards for manufacturers, to build the largest EV charging network in the world. EEI will accept nominations through January 28, 2018. Learn more about the award and its selection criteria​. The domestic and international winners of the 92nd Edison Award will be announced during the EEI Annual Convention, to be held June 9-11 in Philadelphia. ​This holiday season—and all year long—EEI and its member companies encourage everyone to be safe and energy efficient, starting with holiday lighting. Decorators can achieve a festive presentation while using environmentally friendly and safe lighting options. Light emitting diode (LED) lights offer the most energy-efficient and cost-effective way to light up your home or business. LEDs produce very little heat, increasing their energy savings and safety over traditional bulbs, and their long operating life—typically 20,000 hours or more, compared to 3,000 hours or less for incandescent holiday lights—helps save even more. An easy way to know if decorative lights are energy efficient is to look for an ENERGY STAR® certification. Lights that are ENERGY STAR® certified use up to 75 percent less energy than conventional lights. Visit ENERGY STAR® for more lighting information. ​Always inspect your lights before decorating. Throw away lights that have frayed wires, damaged sockets, or cracked or missing insulation. Make sure that holiday lights carry the seal of approval of a recognized safety-testing laboratory, such as Underwriters Laboratories (UL). Indoor-use-only light strings are marked with UL's green holographic label, and light strings for indoor and outdoor use have UL's red holographic label. Install or adjust outdoor electrical displays only during dry weather. Outdoor displays require outdoor (low temperature), exterior-rated extension cords, including fixtures, cords, and bulbs. Keep all electrical connections off the ground. Hang sockets downward to prevent water from seeping into them. Do not use more than three sets of standard incandescent lights on each extension cord. Do not run electrical cords through door or window openings where they can be damaged. Plug outdoor lights and decorations into outlets protected by ground fault circuit interrupters (GFCI). Hang outdoor lights with insulated staples or hooks instead of nails or tacks. ​Do not use more than three sets of standard incandescent lights on each extension cord. Keep lights away from carpeting, furniture, and drapes. Turn off decorative lights before you go to bed or leave home, or use a compatible timer. Avoid running cords under rugs, through doorways, or near furniture where they may be stepped on, tripped over, or broken. Do not place cords around or near metal pipes, appliances, or anything that is damp or metallic. Turn off nearby electrical devices when making adjustments.